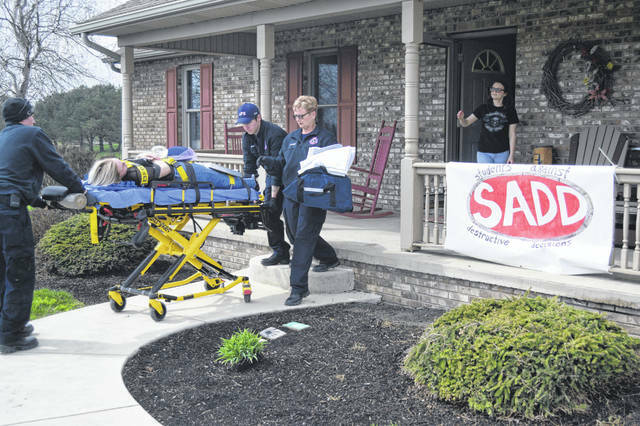 As part of the Reality Party, medics take away a teen who had “overdosed” on heroin. 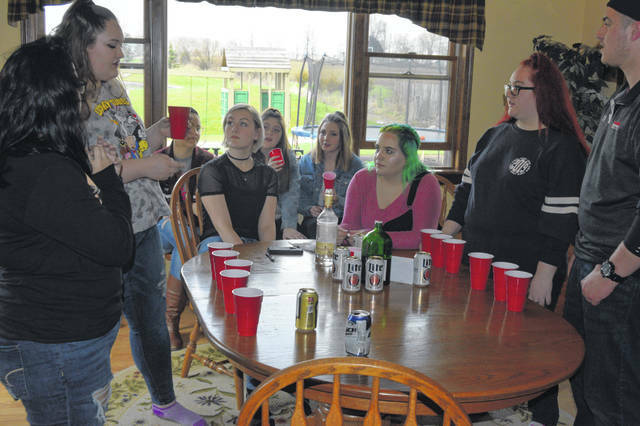 Students from Bath and Allen East High Schools teamed up for the Reality Party where they portray what happens at teen parties when alcohol is involved. Students from both schools took adults through several different scenarios. Some students were seen drinking beer through a funnel, others were drinking moonshine from a mason jar while others were participating in drinking games. The students also dealt with the effects of being under the influence and the bad decisions that are made, like one girl being taken into a bedroom by a male. In another scenario, a girl overdosed on heroin and the Lafayette-Jackson Township squad had to be called to administer NARCAN. “This is like a year-long planning event. We come up with the whole script. We come up with the actors and it’s all student-based. (SADD Adviser Kelly Prichard) K.P. gives us full control over this and lets us choose what we think is really affecting our peers, and that’s what we show at the party,” said Faith Sealscott from Allen East. This is the first time Bath High School has partnered with Allen East for the Reality Party. “I think it’s something that’s really important for our group to do because it is something that does affect our group a lot,” said Jordain Craig, Bath INTERACT Club president. “I think it’s important that the schools come together to work for prevention efforts. I think that kids who want to do the right thing sometimes feel alone in their school so it’s good to know there’s other kids in other schools that want to make good decisions as well,” said Prichard. Around 50 adults toured the Reality Party house. “I feel like a lot of our parents are unaware of some of the things that our kids experience throughout high school and it will be a great eye-opener for some of them,” said Craig. Mixing alcohol and peer pressure at parties is a dangerous combination. “You want to fit in and you want to feel welcomed and everyone likes you so people attend and they really don’t understand what the outcomes could bring of it. Things could turn out very badly,” said Craig.